Grundfos pumps are built with the idea that pumps should be durable, reliable, efficient, and energy saving. As one of the leading manufacturers in pumps and pump solutions, Grundfos works hard to create high quality, innovative products. We have come to know and trust these pump products, and we know you will too. 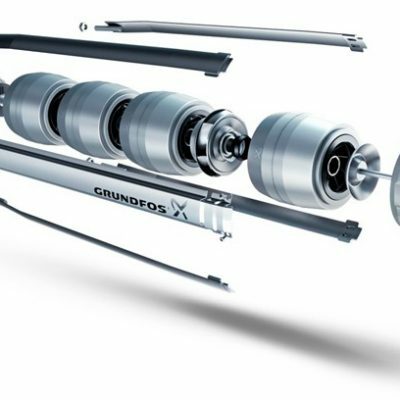 Grundfos sets the standard in high quality pumps by continually improving upon the design and construction of their products to better fit the needs of customers. They are a company that has been meeting and exceeding the demands of the water industry for several years. Not only do they provide high quality pump solutions, but they are leading the way in creating water solutions that are sustainable. They are committed to producing products that reduce CO2 emission levels, reduce water consumption, improve efficiency, and increase re-usage of resources. Mather Pump Service proudly stands by Grundfos and all that they believe in, which is why we offer their products. We sell, install, replace, and repair all pump products. For more information or to order, give us a call today! Our friendly and skilled professionals will happily assist you.